Can _________ win the race against opposition from ________? But what do you do when the result from the prior year was one of the most random in marathon history? In other words, what can we honestly take from the 2018 Boston Marathon and apply to this year's race? Last April, almost all of the elite field dropped out and those who remained required oars to navigate through the wind and rain to get to the finish. 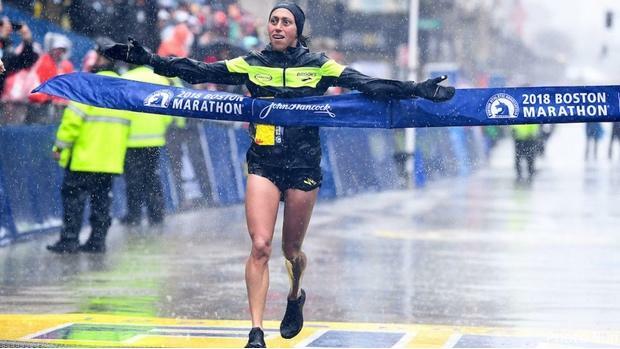 In the women's race, Desiree Linden went from almost dropping out in the early miles to pulling off a stunner, becoming the first American woman to win the race since 1985. The win had a mythic quality to it, both because of the comically bad weather and the way it embodied the ethos of Linden's entire career. A year later, it's still difficult to contextualize. Linden thrived in the horrid conditions, or at the very least she managed them. Others did not. Like the rest of the crowd in the media room, I had been transfixed with Linden's final miles that I lost track of the rest of the race. When names like Sellers, Duchene and Hyland popped up on the final results board, I assumed there was some kind of error. If that top ten featured household names, both from the United States and abroad, there would have been less parsing of Linden's win. None of this, I'm sure, was of any concern to Linden, who won the race she coveted the most. Wind, rain, DNFs, who cares? This year, the focus will once again be on Linden and the weather. On Wednesday, race officials warned that the conditions could mirror 2018. Current weather predictions are predicting similar to 2018's race. Please keep an eye on extended forecast, dress accordingly: extra layers, gloves, hats, and waterproof gear. @BAA will continue to update entrants through emails and social media. Stay informed and be prepared! After Boston last year, Linden was her normal steady self. She finished sixth in New York in the fall. From the outside, this buildup looks to be on course, with a 71-minute half marathon in the middle of March and no setbacks. Her personal best in the marathon is far from the best in this field, but it's hardly worth repeating how irrelevant that fact is. Linden proved last year she can deal with any weather conditions and nobody is more familiar with the course than her. Those two factors, as we saw last year, have outsized importance in Boston. With the craziness of race day in 2018, it's easy to forget the headlines entering the race wasn't focused on one woman (Linden), so much as it was on the American quartet of Jordan Hasay, Molly Huddle, Shalane Flanagan and Linden. All four were capable of winning the race and ending the American drought. One did, so it was mission accomplished for the United States. But outside of Linden, none of the three had a good race. Flanagan finished seventh, so delirious from the conditions that she thought she was winning the race at certain points. Huddle suffered from hypothermia and took 16th. Hasay withdrew from the race the night before, citing a stress reaction in her heel. Of those three, just Hasay is back for this year's race. Her injury-filled 2018 obscured a promising start to her marathon career. In her debut, she took third in Boston in 2017. That fall, she ran a 2:20:57 in Chicago, for another third-place finish. But that was the last marathon she completed. While there are legitimate questions about Hasay's durability, she's already proven that she can be among the world's best at the distance. Like Linden, she's run a 71-minute half marathon in her buildup. More importantly, she appears healthy. Since she scratched last year, we won't know how she will fare if the weather devolves. But she's had success on the course before and has the top end speed to remain with the lead group if the pace is ambitious. Hoping for an honest pace (and good weather) will be a group of Kenyans and Ethiopians with personal bests below 2:22. It's a veteran-heavy pack led by Edna Kiplagat, Aselefech Mergia, Mare Dibaba, Sharon Cherop and Caroline Rotich. All but Mergia have major marathon titles though she's won in Dubai. All have been around long enough that they don't offer anything the Americans haven't seen before. Kiplagat is the most consistent and, by default, the biggest threat to win of this group. Her ceiling isn't as high as it was, but she is able to capitalize if others make mistakes. By comparison, we know much less about the woman with the most imposing personal best, Ethiopian Worknesh Degefa. The Ethiopian has never run a marathon outside of Dubai, which is a bit like a clean-up hitter never batting outside of home run-friendly Coors Field. As expected, her times are fast. She ran 2:17:41 this year to finish second, which was good enough for fifth fastest in history. Even though comparing Dubai to Boston should only be attempted by someone who wants to end up with a headache, it's hard to look away from someone with a 2:17 personal best. She might be the next big thing in the marathon, or she will discover that hills aren't for her and drop out. Boston will be Belaynesh Oljira's fourth marathon of her career. The 28-year-old debuted at the distance last year, racing in Houston, Prague and Frankfurt. Her personal best came in the final race when she ran 2:21:53 to place second. Her relative inexperience in the event and her success on the track (she was third at the 2013 World Championships 10,000m) make her a bit of a wild card in this race. The woman who beat her in Frankfurt, Meskerem Assefa, is also entered in the race. Assefa won her last two marathons and her busy schedule of 15 marathons in the last 6 years means she's not likely to drop out of the race. After she left the Bowerman Track Club, Betsy Saina has been flying a bit under the radar, particularly in the United States. She's put together a solid last two years, highlighted by a victory at the 2018 Paris Marathon in 2:22:56. Her tune-up for this race included a 1:07:49 at the Marugame Half Marathon in Japan. That mark was an improvement of 1:28 from the previous year at Marugame before her win in Paris.